Harvesting Watermelons – When is a Watermelon Ready to Pick? Home grown watermelons are one of the real sweet treat pleasures of summer. How do you know when your watermelon is ready? There are lots of tips that will help you with harvesting watermelons. Just remember that patience is a virtue with this summer favorite. Vegetable gardening is a love of mine and watermelons are one of my favorites, so I have been trying to get some to grow in my garden. 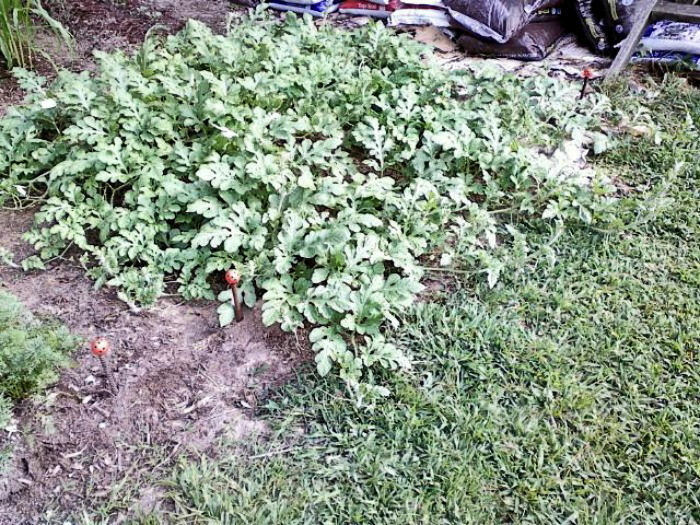 Readers of my blog may remember my posting about my love/hate relationship with my watermelon patch. This is one plant that tests the patience of a saint! Watermelons are not the only popular melons to grow in a home garden. Cantaloupes and honeydew melons are great too. See my tips for growing these melons here. Did you know that watermelon is thought of as both a fruit and a vegetable? It is considered a fruit because it grows from seed, and has a sweet flavor. But it is considered a vegetable because it is harvested and eaten like other vegetables and is a member of the same family as squash, pumpkins and cucumbers. My watermelon patch that is spreading like crazy. It seems to grow a few feet every day. The darn thing was sprawling all over my garden with not a watermelon in sight until a little while ago when it started producing in large numbers. Finally…it’s time to harvest them! But wait. They look ripe and they are heavy, but I get only one chance to do this right. What do I need to be aware of when it’s time for harvesting watermelons? The trick is to make sure that they are neither too ripe, or not ripe enough, but how do we know? Seed packages are a wealth of information. They tell you when to plant the seeds, how far away to space them, and how long they take to grow. 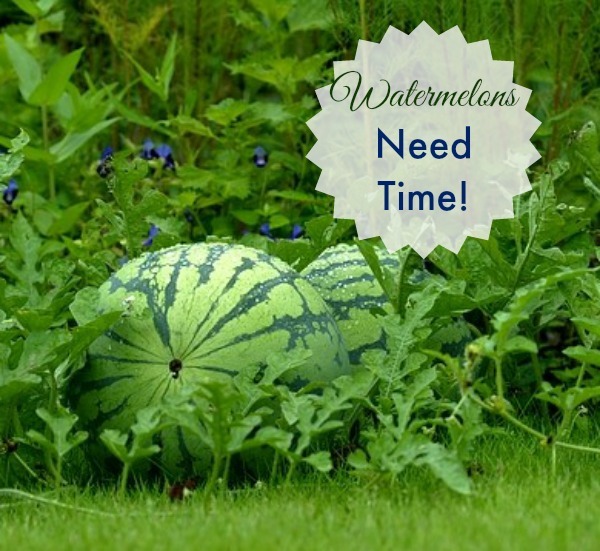 The time to harvest can vary slightly but most watermelons will be ready to harvest 80 to 120 days after the seeds have been planted, depending on variety. 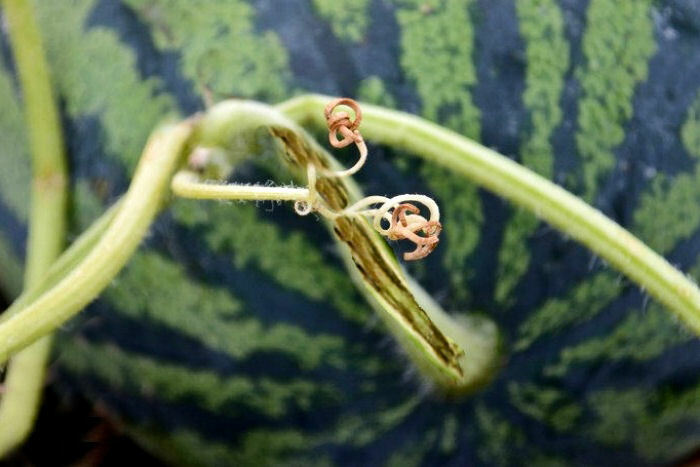 Those curly green things growing on the ends of your melon will first turn yellow and then change to a brown color. 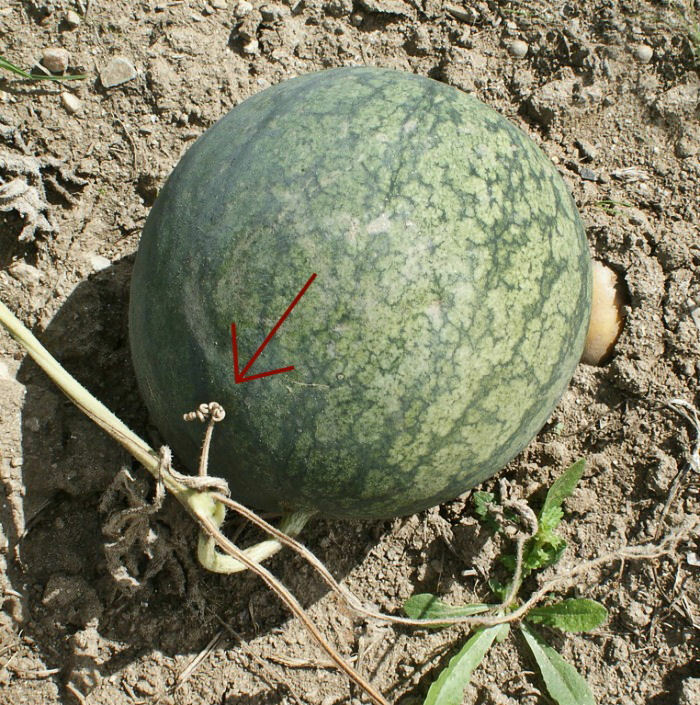 When this happens, it means the plant is no longer feeding the watermelon and the time for picking one is getting close. If your tendril looks nearly dead, the melon is definitely ripe, and could even be over-ripe. Pick these ones for sure. 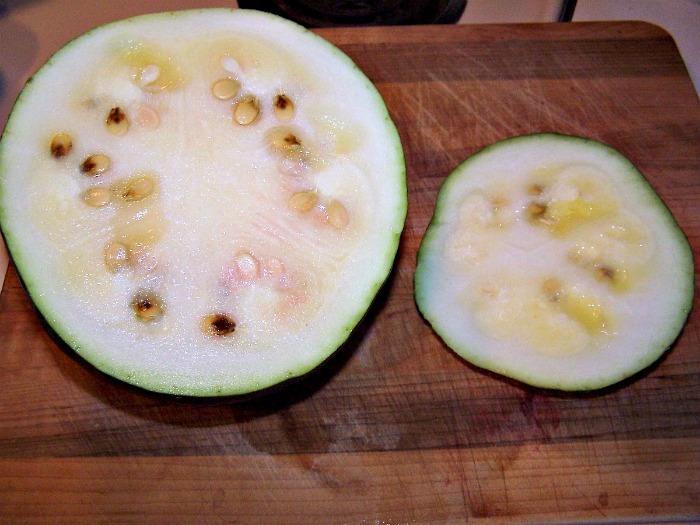 Sometimes the stem of the watermelon will split on the stem itself just above the top of the melon. If there is a small crack at this point, it indicates that the fruit should be ripe and ready to harvest. Note: you don’t want the watermelon itself to crack. That is a whole separate issue. Try pressing on the watermelon. If you find that it gives a little, it means that it is ripe. Don’t press too hard, though, or you will bruise the fruit and this could ruin the quality and taste of the melon. 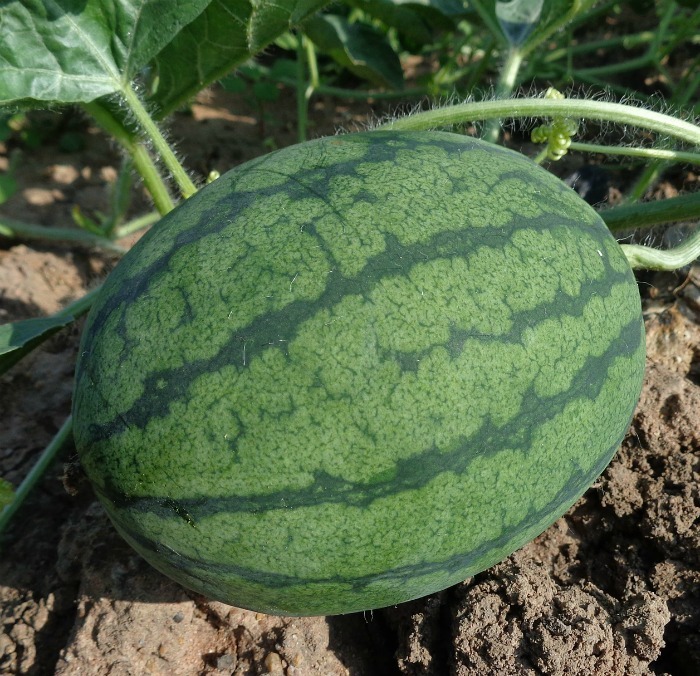 Watermelons sit on the ground as they mature and their bellies change color. As the plant gets closer to the time for harvesting, the underside will turn from green to white or yellow color (depends on the variety). Also, look at the surface of the the melon. It will start to take on a dull color. Another thing to check for is the color between the stripes, if the melon grows with them. There should be some contrast between the stripes. Many seed packages will tell you what to expect for size from the melons that grown. Check the expected size and if it’s close, all things being equal, it should be near to ripe time. 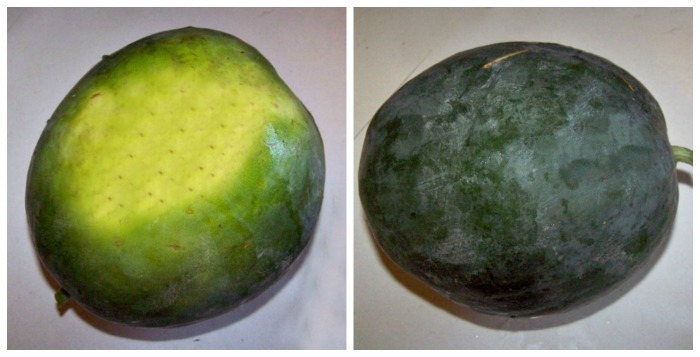 The watermelon on the right is more likely to be ripe than the smaller one on the left since it is closer to the size that is expected from the plant. I have to admit. I’m not the best at this trick. It appears my gardening ears don’t differentiate between thump and “don’t pick me now, I’m not ripe.” But for those of you with better hearing than mine, the theory is that if you pick up a watermelon and thump it with your hand, it will make a hollow sound indicating when it is ripe. Apparently the “thump” test is difficult for less-gifted ears. One cut into this melon proved to me that there must be another test that will be more accurate than listening for a hollow sound, since this is what awaited me. 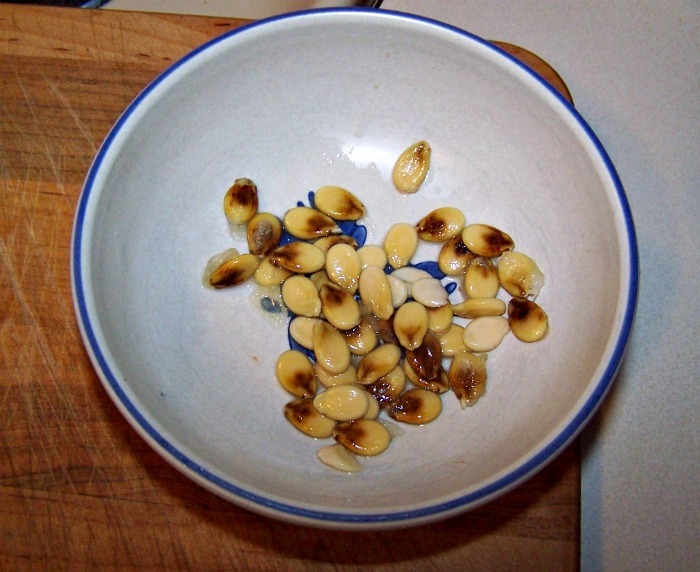 Dang it all, not even the seeds were ripe enough to save. However, I was impatient with my test and tried it long before the package told me that it might be ready. That really is the best test of all and you need patience to see it through! Something tells me that the 80 -120 day rule might have been a good one to follow. It is a very good thing that I had nine more melons out there waiting for me. Follow the tips above and watch for the signs. Try to make sure that you’ve waited the number of days that your package tells you to, and check to see if your fruit shows the signs that it’s ready to harvest. If you do, you’ll be well on your way to enjoying fresh watermelon on your summer picnic table. What tips do you have for harvesting watermelons? Let me know in the comments below. Admin Note: This post first appeared on the blog in August of 2014. 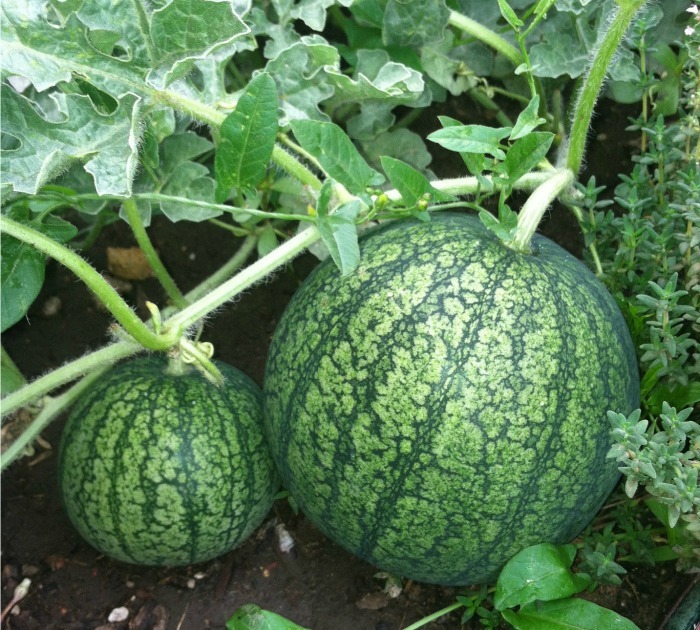 I have updated the information, and added new photos to give a better idea of harvesting watermelons. We made the same mistake, the hollow thump seems elusive to me as well. Oddly enough I am a Taurus as well. I had heard about the tendril, but not the split in the vine. Thanks for the tip!! I too failed at the thump test, it sounded hollow but ended up mostly orange and white inside. What’s frustrating is heavy rain has been making others burst before I can harvest them. Just today I found one split open, ripe on the inside nice and red. Thing is the stem was still green, no brown color or splitting. I’m now really confused. I guess trial and error and a test of my patience will my melon future. I had the watermelon garden surrounded by fencing, some melons grew high on the fence. I used green sacks made for oyster(like orange bags) to support them like hammocks which works well. Have you ever had watermelons growing from a fence? Some of my melon vines (first year for watermelon) snuck out of the garden and attached themselves to a fence around the blackberry bush. I am trying the nylon hose trick to support one now so we’ll see. It took almost 4 months from planting for the vines to put on any fruit and now we have over a dozen in various state of growth. Since we live in the Phoenix area the time to harvest from the seed packs is less than helpful most of the time. Thanks for the extra tips, we may be eating watermelon for Halloween! You can also use iWatermelon Deluxe. 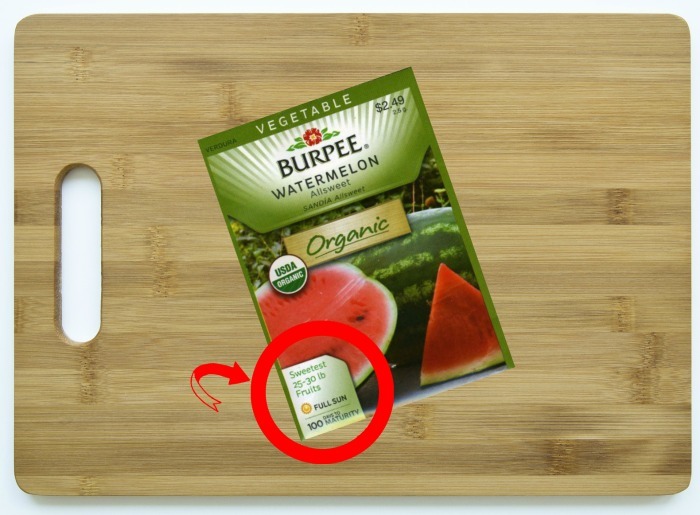 It’s an app to detect a ripe watermelon. You simply place your device on the watermelon and tap it 3 times, then after a short sound analysis, the app tells you if the watermelon is ripe or not.